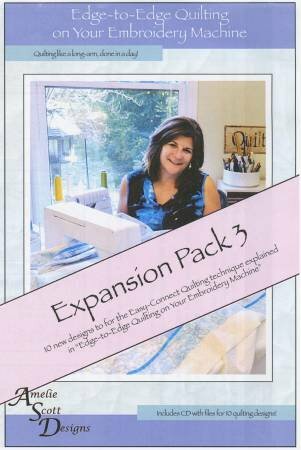 This expansion pack provides 10 additional quilting designs to use with the EasyConnect Quilting technique explained in our book, EdgetoEdge Quilting on Your Embroidery Machine. Intended to complement the book, the expansion pack provides even more ways to get results that look like a longarm, but quilted on your embroidery machine. All files are available in three sizes. The size of each design varies slightly, but each design is no larger than: Small 5.33 x 9.5 Medium 6.44 x 11.5Large 7.55 x 13.5 The CD that comes with this book contains files in the following formats: ART, DST, EXP, HUS, JEF, PES, VIP, VP3. To use this CD, you must have the instructions from the book, EdgetoEdge Qullting on Your Embroidery Machine.